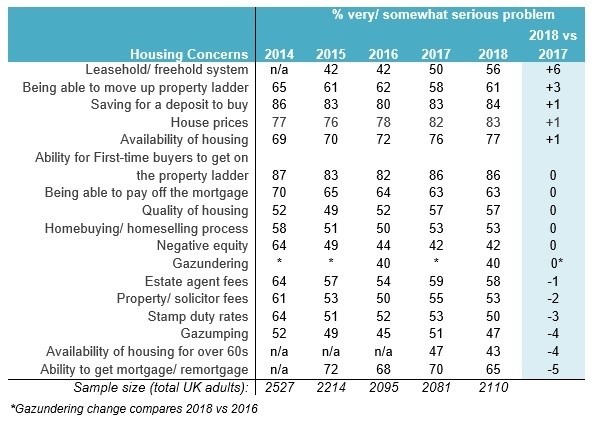 The YouGov survey, polling over 2000 UK adults, is conducted on behalf of HomeOwners Alliance and BLP Insurance and has been trending housing concerns for five years. In further evidence of the worsening crisis, the survey found the quality of homes is a growing issue with 57% of adults saying it is a serious problem up from 52% in 2014. 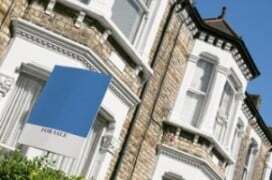 “The housing sector in the UK is on its knees. There’s a shortage of building, a constant stream of stories surrounding poor quality and unfair deals for homeowners, a lack of social housing, rising homelessness and a leasehold system that is dangerously broken. As our survey shows, these problems have escalated over the last five years and the crisis is deepening. We’ve become desensitised to the headlines. “The results of this survey paint a bleak picture for both the UK housing industry and potential homeowners. Concerns around quality of build reflect the serious deficiencies in quality within design and build procurement which are severely impacting confidence in the housing sector. To meet this challenge design codes and reviews should be implemented industry-wide. With additional stamp duty reforms introduced this year to assist first-time buyers, concern with stamp duty has subsided further over the past year (now 38% of UK adults say stamp duty is a serious problem down from 58% in 2014). Regionally, concern about stamp duty rates is higher in East of England (59%) and London (57%) and lower in the North. The fastest rising housing issue over the past year is the leasehold/ freehold system. Up 6% in 2017 and up 8% in 2017, 56% say the leasehold/ freehold system including service charges, ground rent and other fees is a serious problem. Even higher levels of concern are registered in London – 69% (up from 53% in 2017). The proportion who say getting a mortgage or remortgaging is a problem is down. Down 5% over the past year, 65% of UK adults say the ability to get a mortgage/ remortgage is a problem (and down from 72% in 2015). 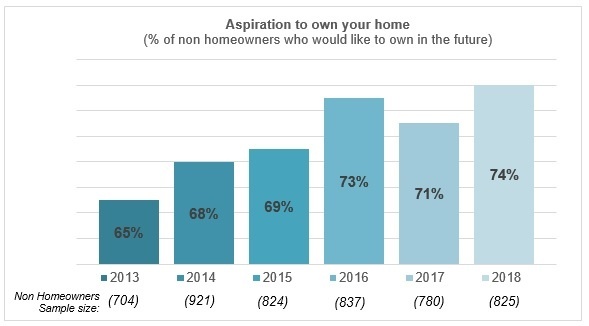 A similar drop is evidenced among aspiring first-time buyers, down 4% in the past year, 71% of aspiring homeowners say getting a mortgage is a problem (down from 78% in 2015). Stamp duty has further receded as an issue. Likely as a result of first-time buyer relief, the proportion registering this as a problem has reduced 3% over the past year to 50% (and down from 64% in 2014). 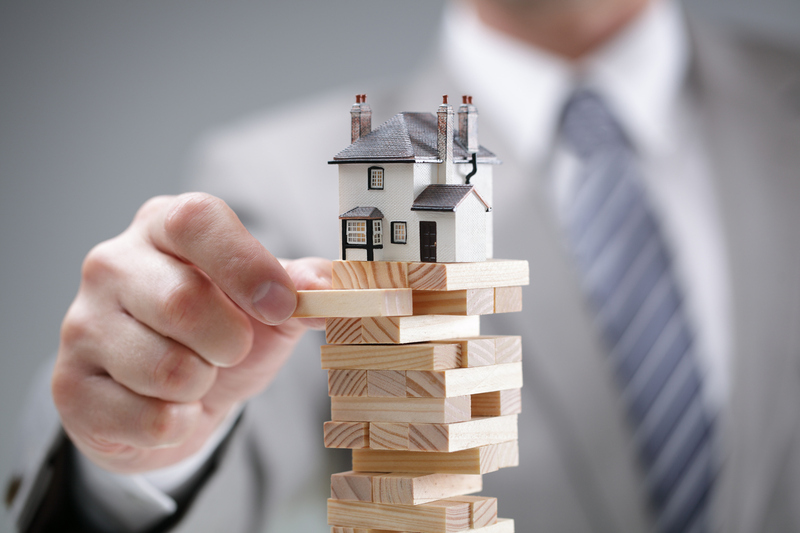 Negative equity remains a more significant issue in certain parts of the country. 42% of UK adults overall say negative equity is a serious problem, while the level is higher in Northern Ireland (66%), Scotland (49%), the North East (49%) and North West (48%). 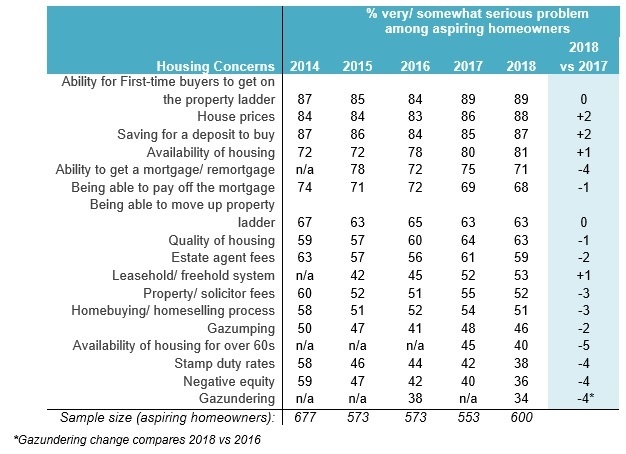 House prices, the availability and quality of homes, the leasehold/ freehold system, being able to move up the ladder, stamp duty, the home buying/ selling process and gazumping all register higher levels of concern in London than they do nationally. 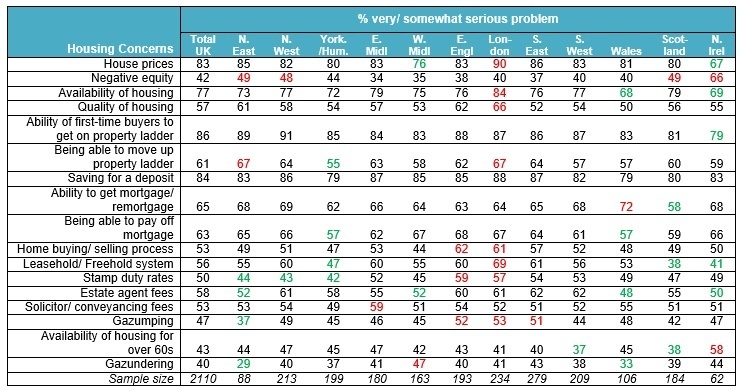 90% of Londoners up from 84% in 2014 say house prices are a serious problem. 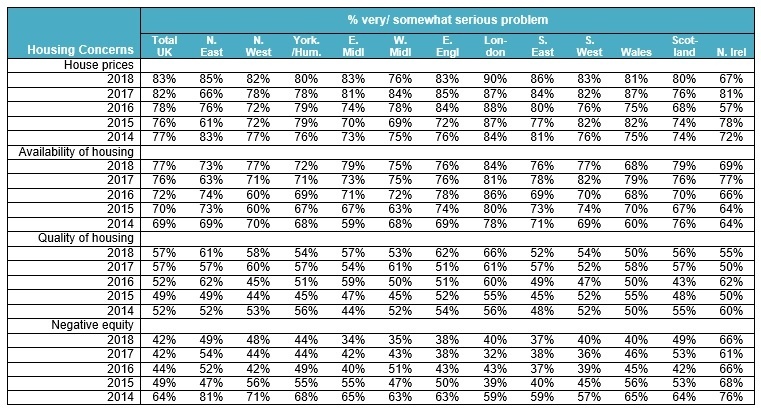 84% in London up from 78% in 2014 say housing availability is a serious problem. 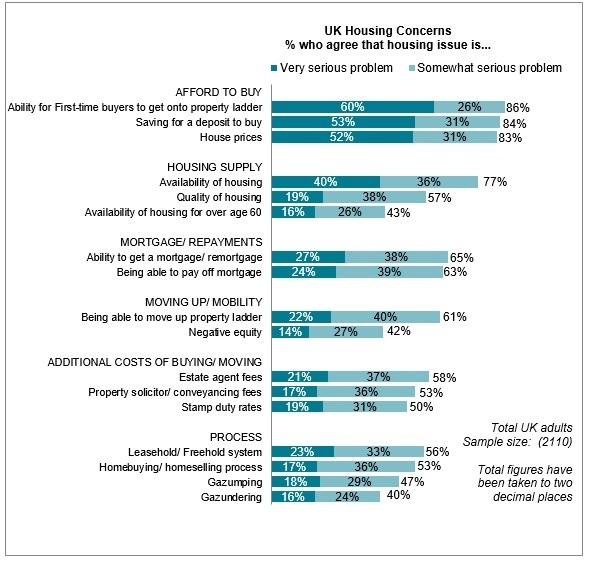 66% of Londoners up from 56% in 2014 say quality of housing is a serious problem. Negative equity concern higher in Northern Ireland (66%), North East (49%), North West (48%) and Scotland (48%) than UK level overall. than UK overall (43%) and less so in South West (37%) and Scotland (38%). Leasehold/ freehold system is less likely to be seen as a serious issue in Scotland (38%) and Northern Ireland (41%). It’s all governments fault, I said to myself 30? Years ago ,price rises should be pegged at 1%? Coz if not one day we are going to in the future have huge housing problem, I should have had a bet, well it’s here and getting worse , Margaret Thatcher did,nt help right to buy was a big mistake along with buy to let .why aren’t councils build council houses,it’s private everywhere , we have a New estate just a few hundred yards from where I live built on farmland why not council houses .countries gone bonkers. New build quality is rubbish, look on snagging.org or on any snagging site . Funny how the loosing buyer thinks that we encourage gazumping, with fees at rock bottom an extra 10k offer is hardly going to pay our rightmove fees is it?